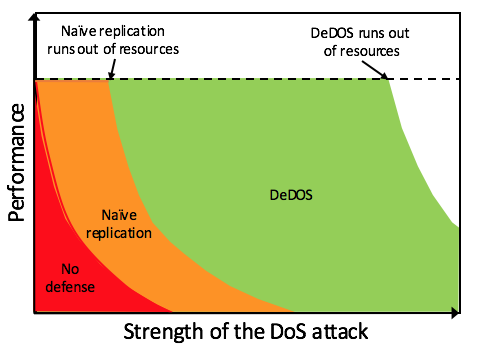 The goal of this project is to create fundamentally new defenses against distributed denial-of-service (DDoS) attacks that can provide far greater resilience to these attacks compared to existing solutions. Today's responses to DDoS attacks largely rely on old-school network-based filtering or scrubbing, which are slow and manual, and cannot handle new attacks. DeDOS takes a radically different approach that combines techniques from declarative programming, program analysis, and real-time resource allocation in the cloud. Rather than relying on traditional detection and mitigation techniques, the project aims to develop a new software architecture from the ground up that make it significantly harder for an attacker to slow down to system without expending large amounts of resources. For example, instead of running monolithic software and naively replicating it when under an attack, DeDOS logically and physically restructures complex software systems into smaller components that can react to attacks at a much finer granularity. DeDOS also uses state-of-the-art resource allocation algorithms to achieve near-optimal use of system resources and to support critical, time-sensitive applications, such as situational awareness. The Penn press release and the Georgetown press release contain some more information about the project. We are happy to announce the first release of the DeDOS platform! Code, documentation, and installation instructions are available here. Also check out DoSarray and DoStbin DoS experimentation tools and data. Meng Xu, Robert Gifford, and Linh Thi Xuan Phan. Saeed Abedi, Neeraj Gandhi, Henri Maxime Demoulin, Yang Li, Yang Wu, and Linh Thi Xuan Phan. M. Xu, L. T. X. Phan, H. Choi, Y. Lin, H. Li, C. Lu, and I. Lee. 28th USENIX Security Symposium, 2019. Nik Sultana, Shilpi Bose, and Boon Thau Loo. 11th International Conference on COMmunication Systems & NETworkS (COMSNETS), 2019. Nik Sultana, Pardis Pashakhanloo, Zihao Jin, Achala Rao, and Boon Thau Loo. 4th IEEE/IFIP International Workshop on Analytics for Network and Service Management (AnNet 2019). Nik Sultana, Achala Rao, Zihao Jin, Pardis Pashakhanloo, Henry Zhu, Ke Zhong, and Boon Thau Loo. FEAST '18: 2018 Workshop on Forming an Ecosystem Around Software Transformation. Henri Maxime Demoulin*, Tavish Vaidya*, Isaac Pedisich, Bob Dimaiolo, Jingyu Qian, Chirag Shah, Yuankai Zhang, Ang Chen, Andreas Haeberlen, Boon Loo, Linh Phan, Micah Sherr, Clay Shields and Wenchao Zhou. Annual Computer Security Applications Conference (ACSAC), 2018. *Lead students are listed alphabetically. Henri Maxime Demoulin, Isaac Pedisich, Linh Thi Xuan Phan, and Boon Thau Loo. ACM SIGCOMM Workshop on Self-Driving Networks (SDN), August 2018. Henri Maxime Demoulin*, Tavish Vaidya*, Isaac Pedisich, Nik Sultana, Jingyu Qian, Bowen Wang, Yuankai Zhang, Ang Chen, Andreas Haeberlen, Boon Thau Loo, Linh Thi Xuan Phan, Micah Sherr, Clay Shields, Wenchao Zhou. *Lead students are ordered alphabetically. First prize for the ACM Student Research Competition at SIGCOMM'17. 15th ACM Workshop on Hot Topics in Networks (HotNets'16), Atlanta, GA, November 2016. *Student orders are listed alphabetically. This is a joint project between the University of Pennsylvania and Georgetown University. The work is funded by DARPA under the Extreme DDoS Defense (XD3) program.